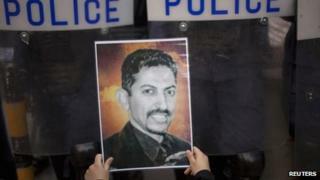 Bahraini human rights activist Abdulhadi al-Khawaja has ended his 110-day hunger strike, his wife says. Khadija al-Mousawi told the BBC her husband started eating voluntarily on Monday evening. Mr Khawaja, a Shia Muslim, is an outspoken critic of Bahrain's ruling Sunni royal family and has been convicted of trying to depose them. Mr Khawaja's decision follows the release on bail of another detained Bahraini activist, Nabeel Rajab. Mr Rajab was arrested on 5 May at Manama airport on his return from the Lebanese capital, Beirut. He is charged with using social networking sites to incite illegal rallies and defame Bahrain's security forces. Mr Khawaja, 51, began his fast as a protest against his imprisonment after being sentenced by a military court in June 2011. Mrs Mousawi said he ended the hunger strike in part because he was being force-fed by two doctors at the prison where he is serving his sentence. He also faced pressure from friends and colleagues to cease the fast and felt the strike had achieved its goal of drawing the world's attention to the anti-government movement in Bahrain, Mrs Mousawi added. Mr Khawaja and 20 others were convicted of plotting to overthrow the state by the National Safety Court, a military tribunal. Seven of them, including Mr Khawaja, were sentenced to life. His activist daughter Zainab is also in jail, serving a one month sentence after she was accused of abusing a policewoman during a protest last month. But in April, Bahrain's highest court, the Court of Cassation, threw out their convictions and ordered a retrial, although they were not released. At a court appearance last week Mr Khawaja was in a wheelchair. Mrs Mousawi said that he intends to boycott the next court session which was due to take place today. Mr Rajab, who has 140,000 Twitter followers, is a vocal critic of Bahrain's ruler, King Hamad al-Khalifa. Late Monday night, he tweeted: "I am free until further notice." Lawyer Mohamed al-Jishi, who represents both Mr Rajab and Mr Khawaja, told the AFP news agency that his client had been ordered to pay 300 Bahraini dinars ($796; £500) and still faces a travel ban. Mr Rajab, a Shia Muslim and head of the Bahrain Centre for Human Rights, last appeared in court on 16 May. Since February 2011, Bahrain's government and Sunni ruling royal family have faced fierce opposition from mainly Shia activists. Bahrain's monarchy has made concessions, but not enough to satisfy protesters. Bahraini security forces have repeatedly clashed with protesters.